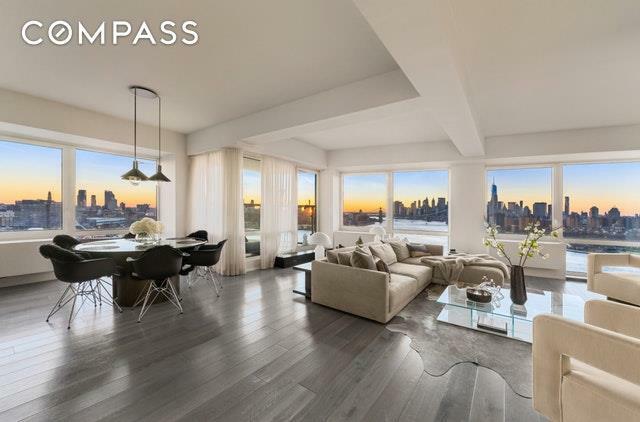 Perched high above the edge of the East River, this custom built penthouse offers sweeping water and Manhattan views that perfectly complement its exquisite interiors. 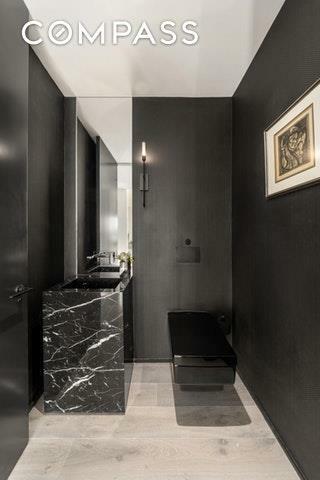 After a complete renovation orchestrated by acclaimed interior designer Nathan Andrew, this sumptuous yet minimalist home welcomes you with thoughtful details around every corner. Each beautiful surface beckons your touch; exquisite marble slabs, custom-cut, ceiling-height black lacquered oak doors, chromium finished Fantini bath and kitchen fixtures, and grey oak LV wide plank floors.As you step into the foyer, subdued tones and glittering light envelop you with a sense of calm.There is a luxuriously appointed powder room off the foyer as well as generous closet space. To the right leads into the great room with a graciously sized living area complete with custom elegant built-ins which conceal a home entertainment center, storage and a dry bar. A terrace graces the corner of the great room, with enough room for a comfortable loveseat and coffee table to relax and enjoy the 180 degree vista.The spacious dining area can comfortably accommodate dinner parties for 12 or more intimate gatherings. 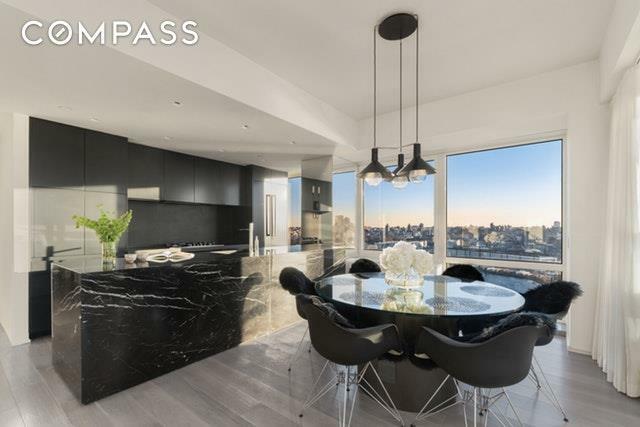 Every detail of the layout and design has been thoughtfully crafted for comfort and entertaining.The sleek, bespoke kitchen has fully concealed appliances, and is punctuated by a massive, book-matched black Nero Marquina island, which gives the impression of being carved from a single block of marble.Views abound everywhere you look. There is no window in this home that doesn't offer a gorgeous tableau of twinkling skyline, magical nightly sunsets, as well as water and light through its floor to ceiling windows featuring automatic blinds throughout.The modernist hallway (an artwork in of itself) leads to the private quarters, where you will find three well-proportioned bedrooms as well as a sizable laundry and linen storage room. The master suite is comfortable and elegant, featuring 2 two closets and a sizable walk-in closet with custom-shelving. Accessed by a sleek pocket-door, the tranquil en suite master bath is ensconced with floor-to-ceiling Woodgrain marble slabs, a custom double vanity and a luxurious open shower seamlessly integrated into the spa-like environmentThe superior attention to detail employed, and the craftsmanship and quality of material used, creates a custom home that is truly second to none.440 Kent Avenue just completed a full lobby renovation and the building is in excellent financial standing. 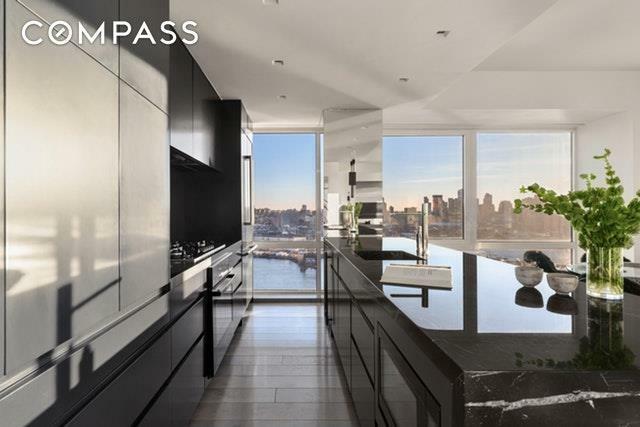 Services include a 24-hour doorman, gym, roof deck, and garaged parking with direct access from the elevators. Nearby services and restaurants (just to name a few) are City Acres Market, Barano Restaurant, Misi, Meckleburg's, Diner, Marlow and Son's,Domino Park, Danny Meyer's Tacocina, and the East River Ferry (dock directly outside 440 Kent).The Williamsburg Montessori School is also located next door.With a quality above all else in Williamsburg- this penthouse is a home that truly must be seen to be appreciated.421-Tax Abatement in place until 2032.